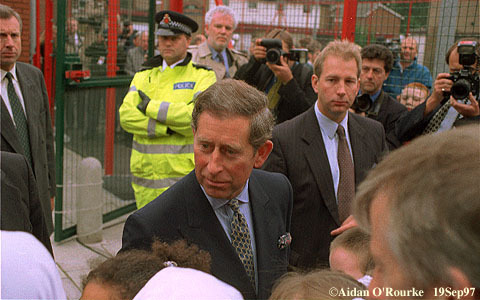 Prince Charles made his first official appearance last Friday since the death of Diana. He went to the Medlock Links Salvation Army centre, on Grosvenor St, where he met community workers there, as well as some of the disadvantaged children of the area. The prince spoke openly and frankly about the recent tragic events, and said he was"very grateful" for the kindness shown by members of the public in 250,000 or more letters, which he had received from all over the world. There was a positive reaction to the more open and relaxed manner of the prince, though there were some in the crowd who were less than keen on him. Two women I spoke to said they couldn't forgive him for what he had done to his former wife, but despite this, they still wanted to see him. When the Prince eventually emerged from the building to go on to his next appointment, he seemed genuinely pleased when people clapped. Other places on his itinerary were Manchester Cathedral, the city centre reconstruction area, Manchester Royal Infirmary, and the Manchester United football ground. Later he opened the British Council's new headquarters, near Whitworth Street. 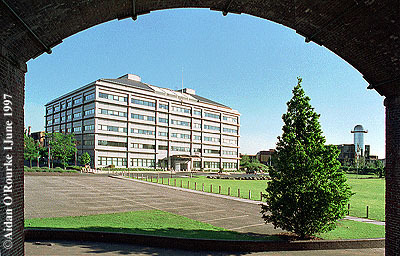 The British Council HQ, built on the site of the old gas works, next to the railway viaduct at Whitworth Street. The British Council is a state-sponsored organisation which helps to promote Britain abroad through cultural and education, particularly English language teaching. In the week that an assembly for Wales was given the go-ahead, with a majority of only a few thousand votes, thoughts have turned to the idea of regional assemblies for England. In the light of the fact that only 25% of people in Wales were in favour of an assembly, the Government are reported to have shelved the idea of English regional assemblies for the next few years. Nevertheless, a Teletext poll revealed that in the North West region, 65% of callers were in favour of a regional assembly, compared with 60% in other areas. They returned, but three days later they were thrown off yet again. I am of course talking about the Runway Two protesters, eight of whom climbed over high security fences on Friday night. They took up positions in the trees, near the "River Rats" camp, from which they had been removed earlier this year. Preparations continue on the site, but the major earthmoving work has yet to begin. In the meantime, the protesters, aided by local residents, will go on taking direct action, until, they say, the first plane takes off from the new runway. That event is still two years or so away, so the protesters will be be kept busy for many more months. Some people question whether further protests are justified. The BBC Northwest Tonight TV programme is asking viewers to say if they approve or not. If you want to express your opinion, e-mail nwt@bbc.co.uk and tell them I sent you! A candlelight vigil will be held by anti-runway 2 protesters at Hill House the weekend after next, when the family have to move out. 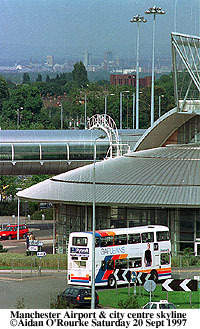 The four hundred year old half timbered building, pictured in the very first edition of "Eyewitness in Manchester", lies directly in the path of the new runway. The house is to be dismantled and put up on another site, where it will become a museum. The Arndale Centre celebrated its 21st birthday this weekend, and Ryan Giggs was there to blow out the candles on a cake specially made for the occasion. At the moment, there are reports that owners P&O are going to sell the centre for £300m. Though generally regarded as one of the ugliest buildings ever to be put up in Manchester, or any other British city for that matter, it has been a huge commercial success, and is always thronged with people during shop opening hours. Redevelopment plans include the removal of all the infamous yellow tiles, and there are also plans to allow traffic back onto Market Street in the evening. With the start of the new university year, the students have returned in force. Oxford Road is full of them, including many new arrivals from other parts of the country who haven't yet found their way around the city. Manchester has the largest student population of any city in Europe, and the number of recruits, from home and abroad, grows every year. And for the first time, students will be able to listen to their own radio station. Storm FM, broadcasting on 106.2 Mhz is the first of its type in Manchester. Up till now, restrictive UK broadcasting regulations have prevented a student radio station from operating, though in the US, campus stations have been popular for years. But this year, Storm FM station has been granted permission to operate for one month. The operators hope to obtain a more permanent status next year. The weather this week has been cool and windy, with many sunny spells. Saturday started cloudy, but cleared to bring a gloriously clear day. Sunday was a little hazier, but still fine, as was today. Temperatures were in the high teens celsuis, about 65 degrees fahrenheit.